And so, for Not So Wordy Wednesday during my week of tribute to senior adults I present to you my two favorite seniors: Mom and Dad! 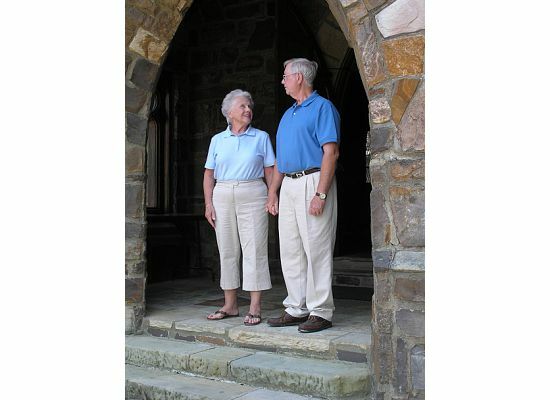 They are pictured here standing on the same portico they stood on just after saying "I do" to each other 50 years previous. I wonder if they had any idea at that time how hard marriage would be and yet how rewarding it would be at the same time? I wonder if they even imagined the family who would follow and admire them so? I doubt it. My parents are blessed and my parents are a blessing, not only to me and my brother and our families, but to many, many other people. They minister to tired caregivers and dying patients with Hospice. They support missionaries and their families with monthly checks so they can spread the gospel. My mom is constantly baking an extra casserole or pound cake to take to a friend or neighbor. My dad continues to do hard, laborious repairs and upgrades in the homes of widows and invalids. They go on mission trips with their church and still roll their sleeves up and get their hands dirty. I cannot list all the ways my parents serve, they are too numerous. They are a shining example to their children and grandchildren. But right now they're probably sitting at a McDonald's drinking coffee and working a crossword puzzle. Later today they'll play a game of cards with friends and tomorrow they'll hit the golf course. They know how to enjoy life and God has graciously rewarded them with a number of years of retirement bliss. They have served Him well and continue to do so. He has lavished His grace upon them and they are grateful. sees good in all his labor--it is the gift of God." Do you have a more recent hero of the faith you'd like to tell me about? I'd love to know about your modern day Trailblazers.